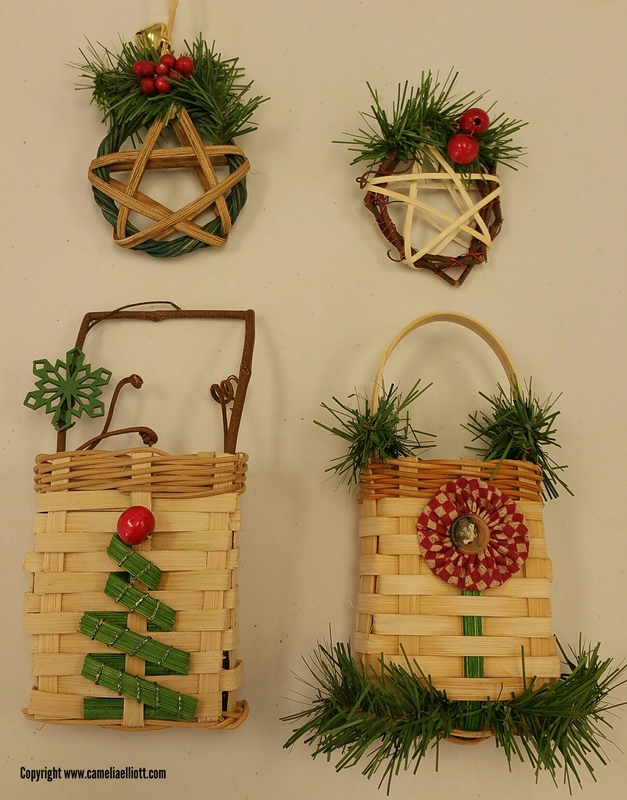 Now that Christmas has past, I am looking through photos and reflecting on a fun day of basket weaving with the gals of Tightly Basketry Guild of the NRV. 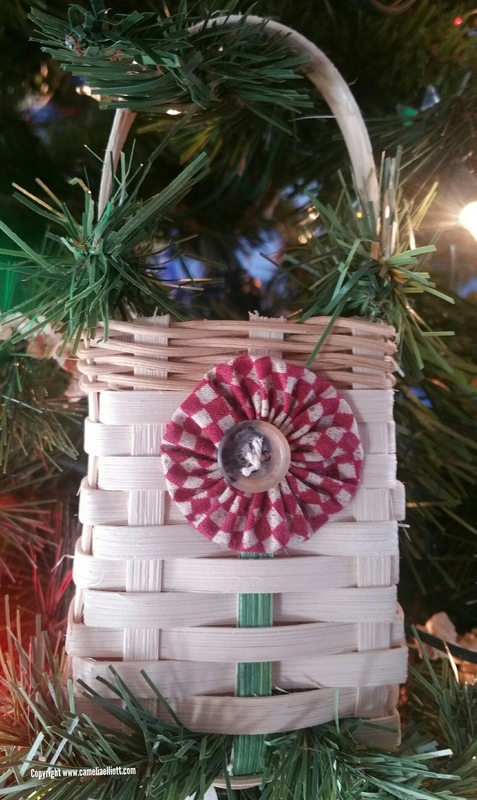 We had a great day weaving darling little ornaments. 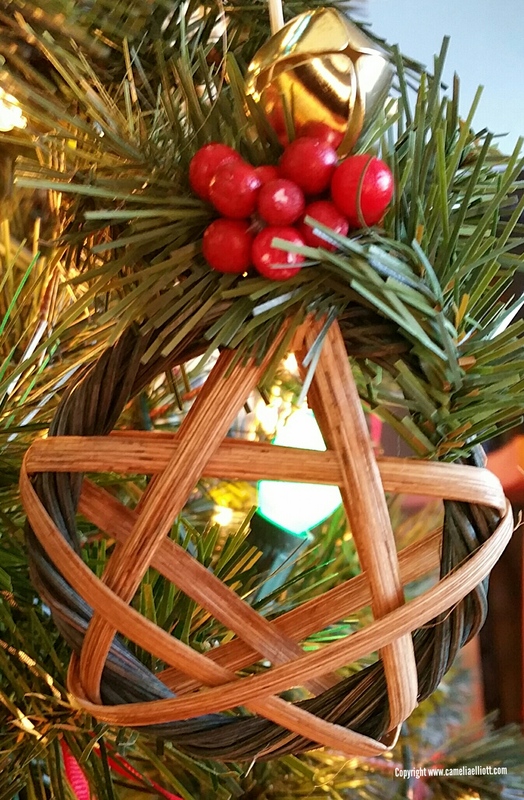 Special thanks to our fearless leader, Deezie Nelson, for weaving an ornament for all of us! I made this one and the other two. 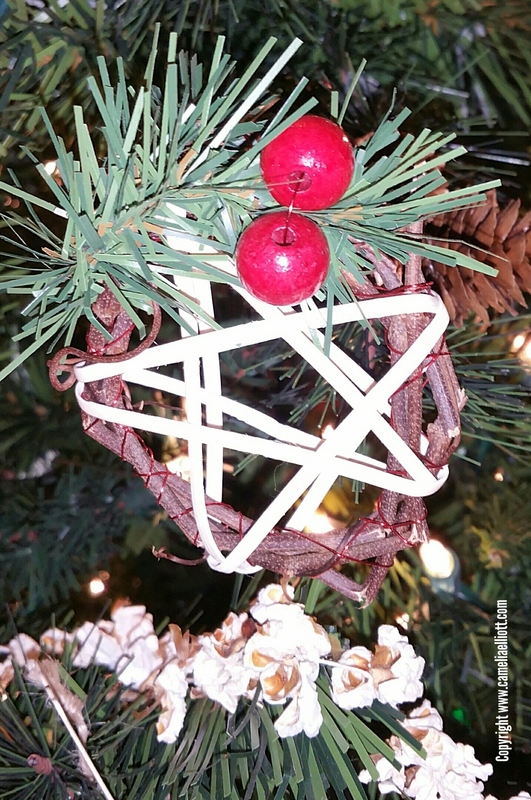 I have always wanted to put a yoyo and button on a basket. I think it turned out cute! 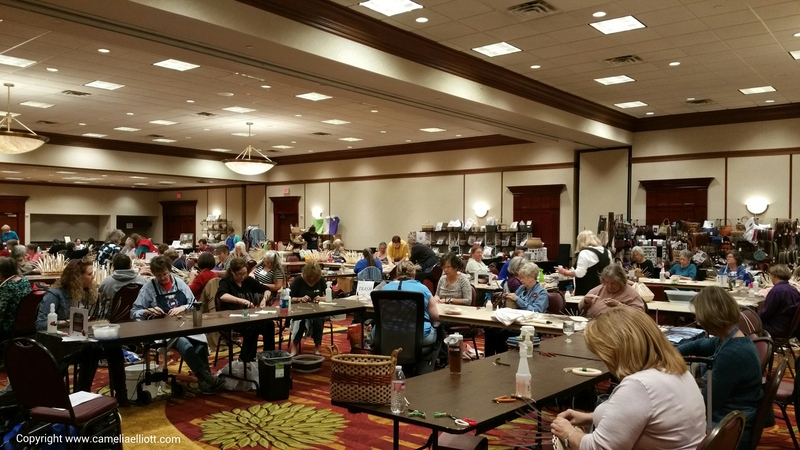 A fun day was enjoyed by all weavers! 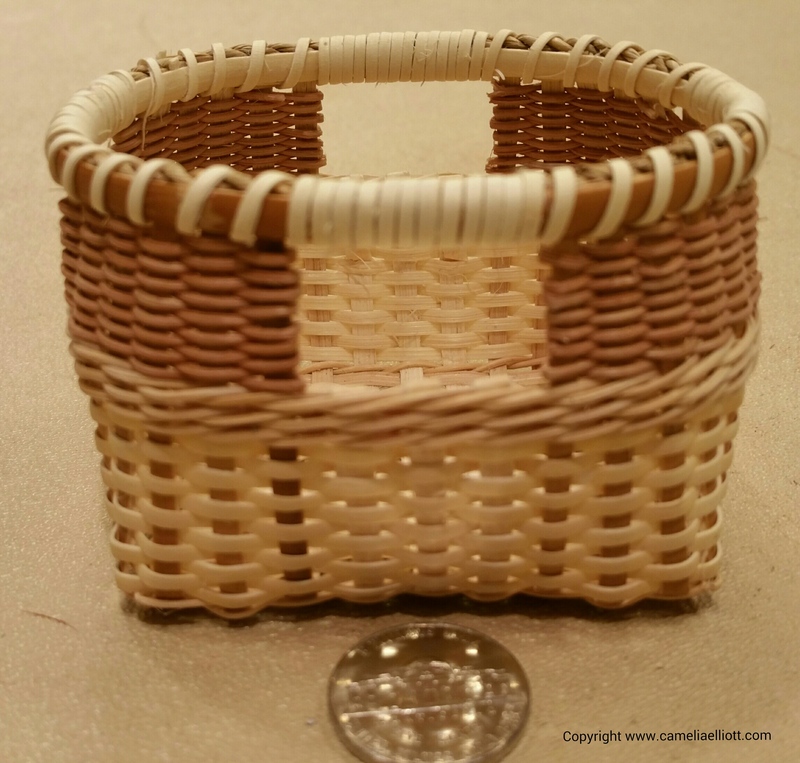 This little basket was fun to weave. I am a blue person so this one makes me smile. 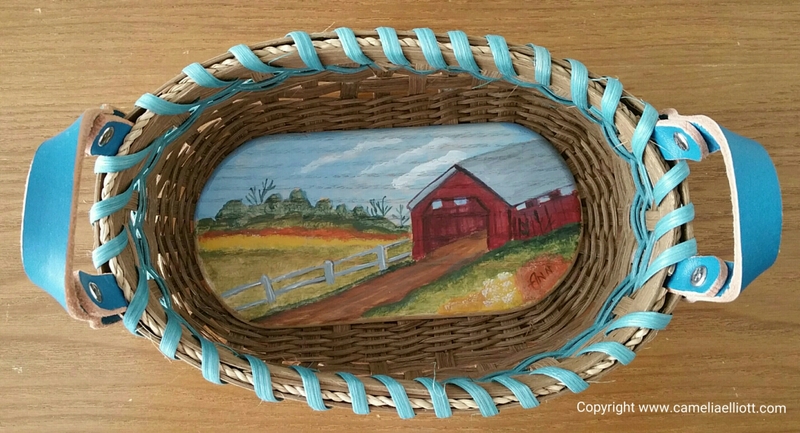 I love covered bridges and purchased this painted base and blue leather handles at the Texas Basket Weaver’s Convention in Austin, Texas. 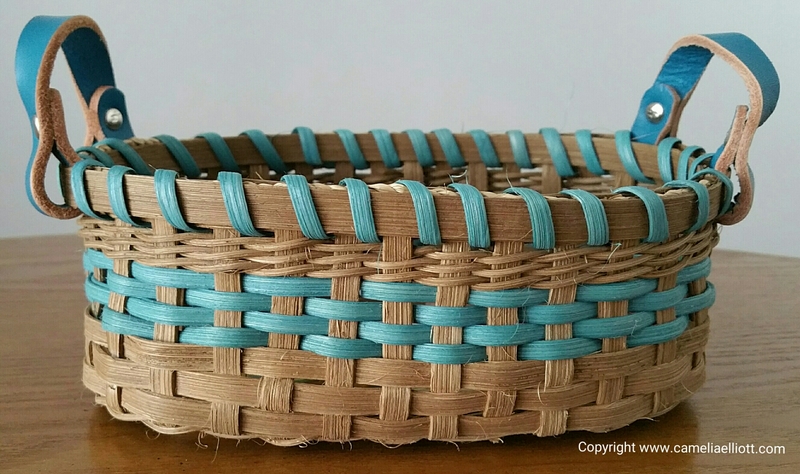 Special thanks to friends in my basket weaving guild (Tightly Woven Basketry Guild of the NRV) for sharing smoked colored reed 🙂 This is my first basket to use this color and I love it! Today, I am feeling accomplished. 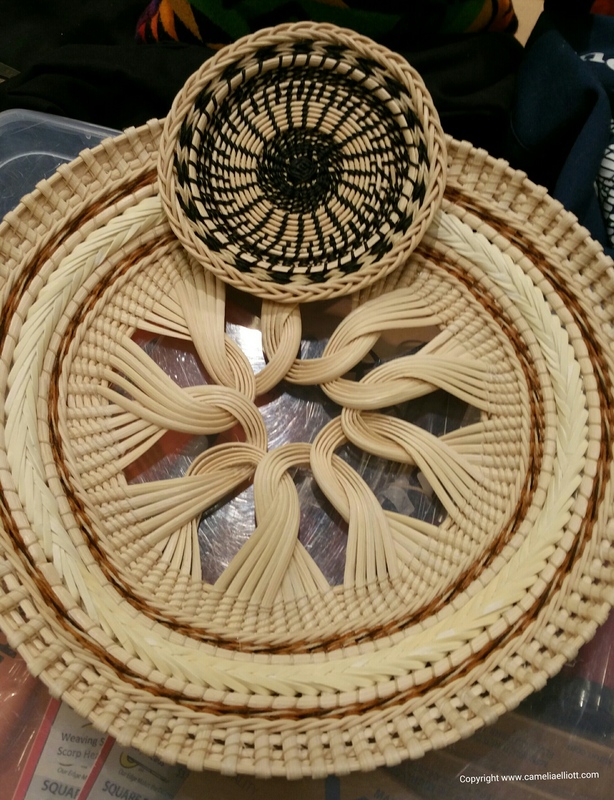 I just completed and signed two baskets that I started in 2013 and 2015! 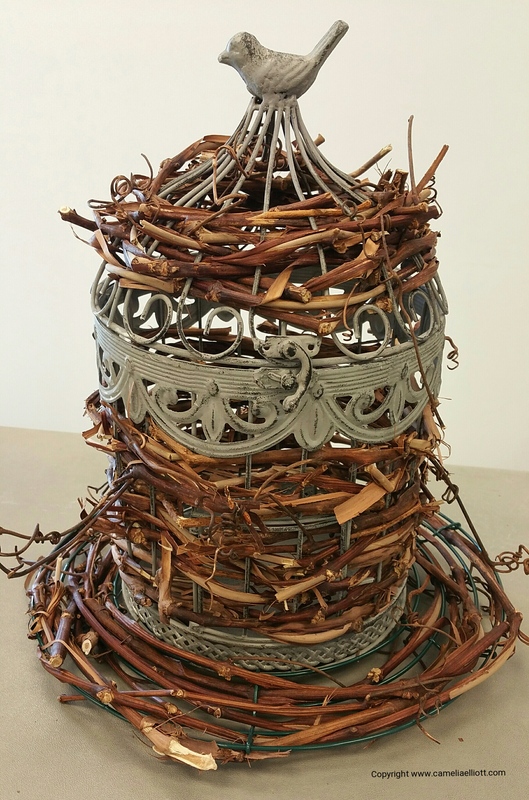 I have always been enamored by baskets that are woven around wire. Recently, I had the opportunity to try out this technique. A friend’s husband was pruning their grapevines and she was gracious enough to call and let me know. 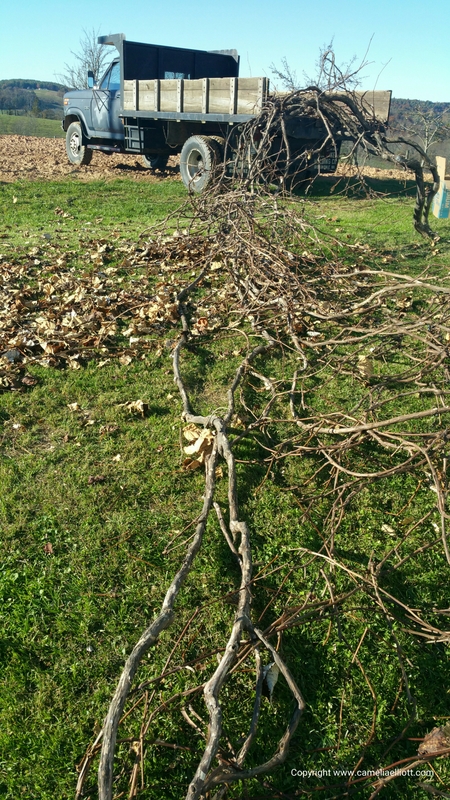 First step: to wrestle the grapevines into a huge box that barely fit into my car. The thought of using reed spokes for the base had crossed my mind but I felt this would not be strong enough. 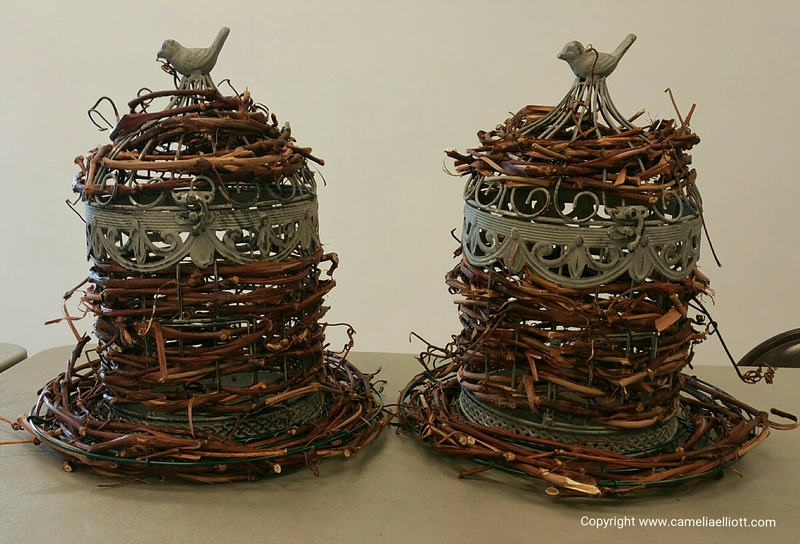 I had the idea to use a curved wire wreath base so there would be a place for the sunflower seeds to fall, as well as a place for the birds to perch. I wondered if I could find a tall circular wire tube to hold the sunflowers but did not have any success finding such a thing. So I strolled the aisles of Michaels and kept looking for something. 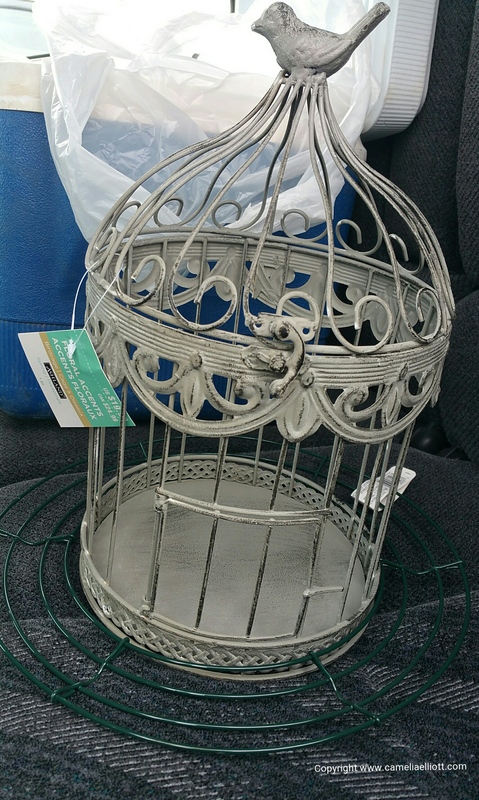 I happened upon this decoative bird cage. Perfect! 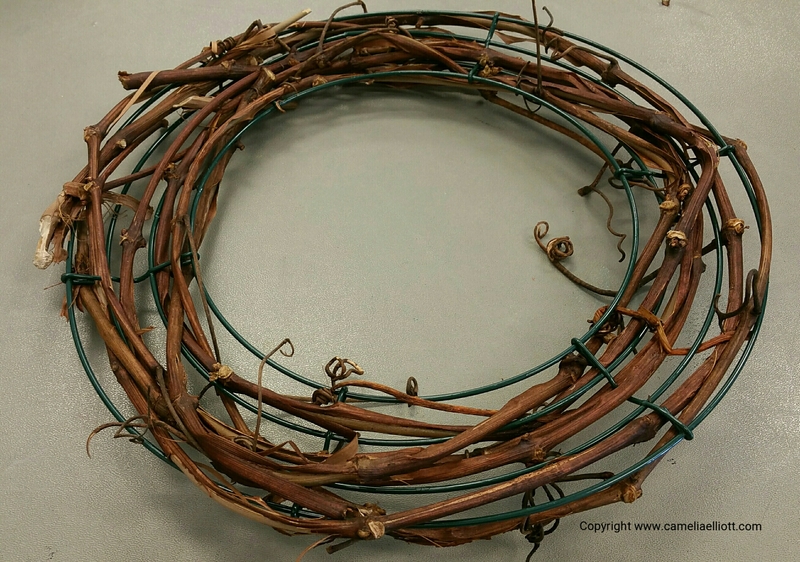 And the wire wreath base proved to be an excellent fit. 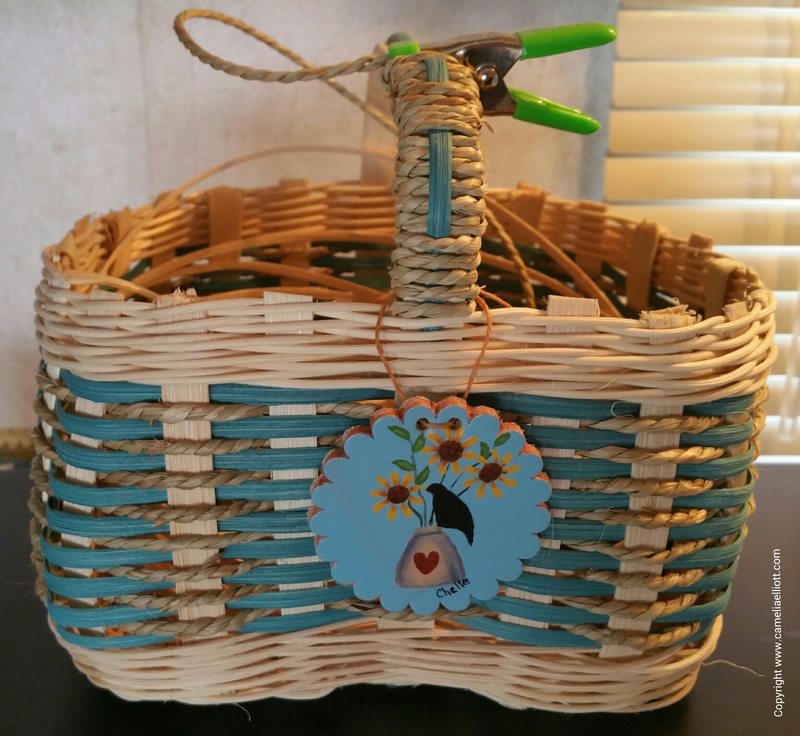 I talked my friend, Judy, into making a bird feeder with me. Back to wrestling grapevines. 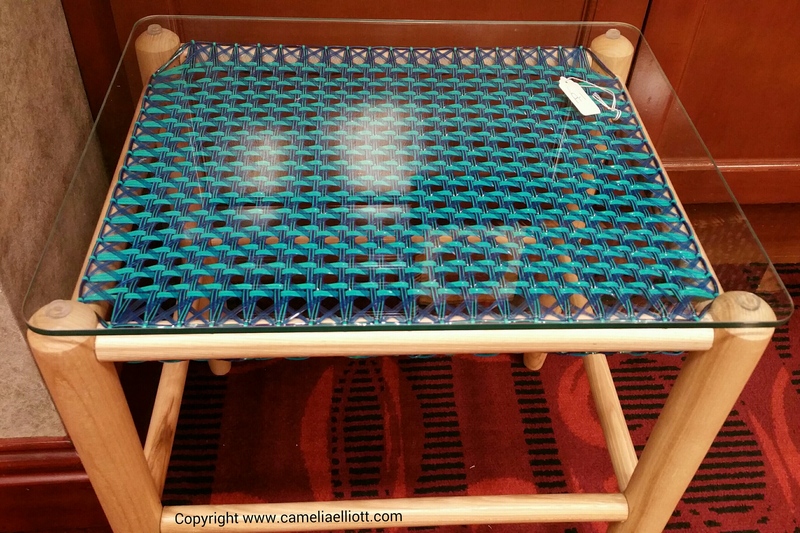 Base is woven and finished. Birdhouses are woven and ready for sunflower seeds. They are loosely woven with gaps, allowing seeds to fall out plus birds can peck through the gaps for seeds. It was a labor intensive day of weaving. 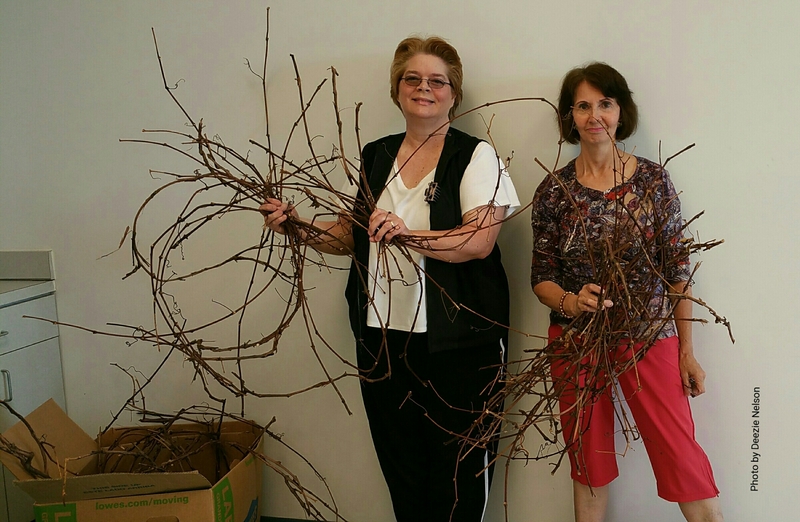 Grapevines are thick and hard on hands to work with. 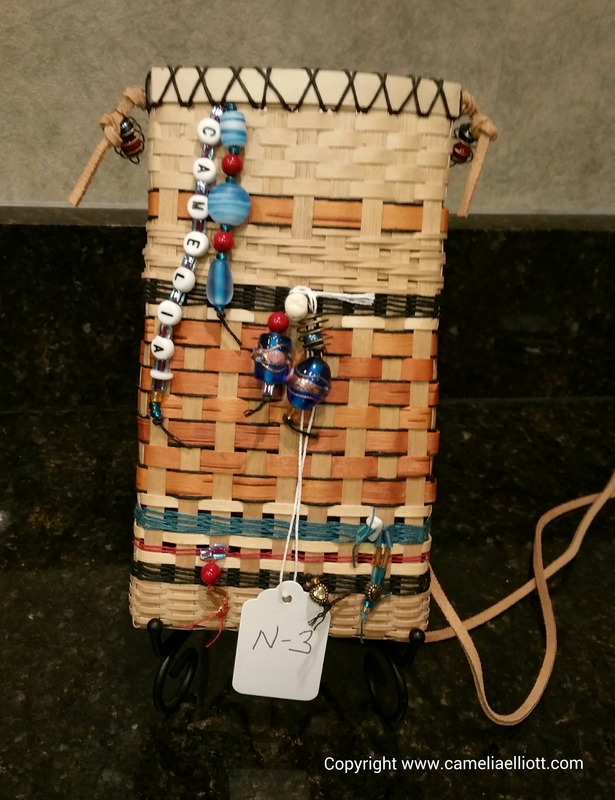 Judy and I are please with the end result, our one-of-a-kind birdfeeder! 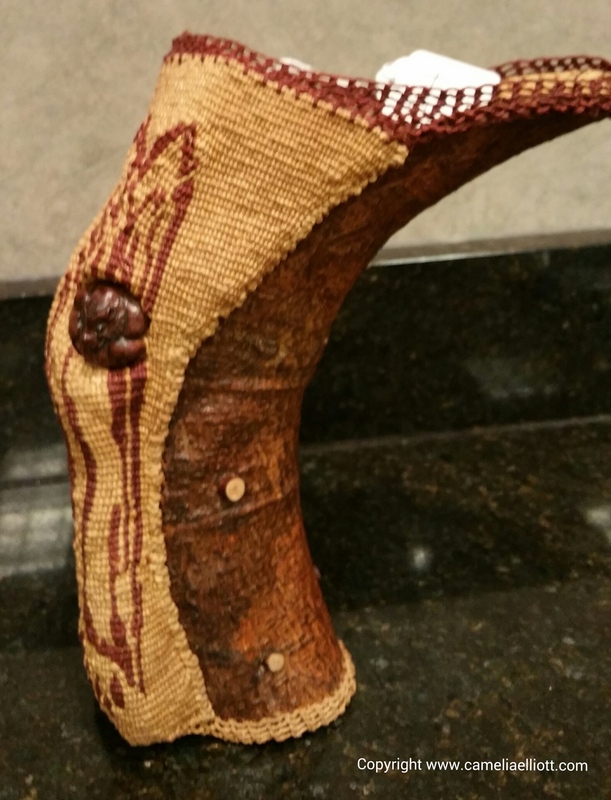 Today, I am posting photos from Texas Basketweavers Association 2015 Gathering. 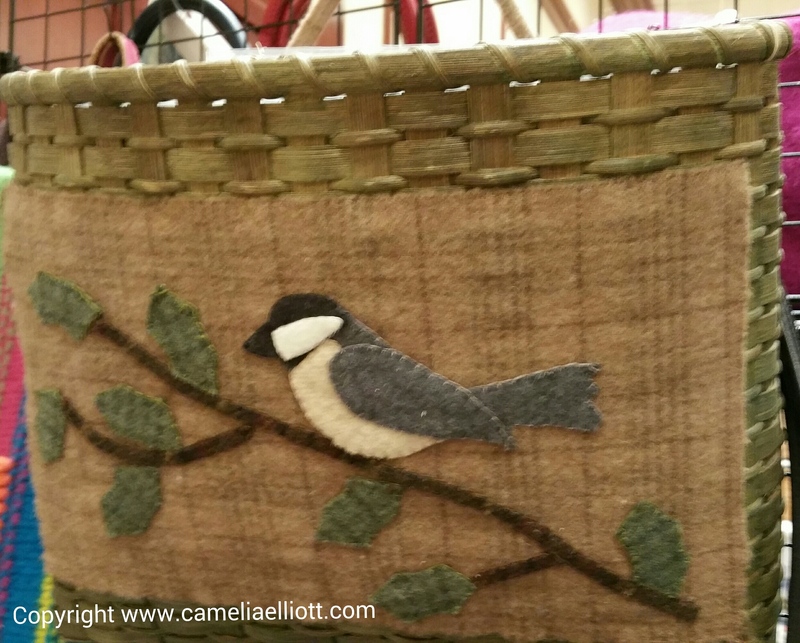 As I walked around and visited with fellow weavers, I had fun seeing what projects these talented folks had created. 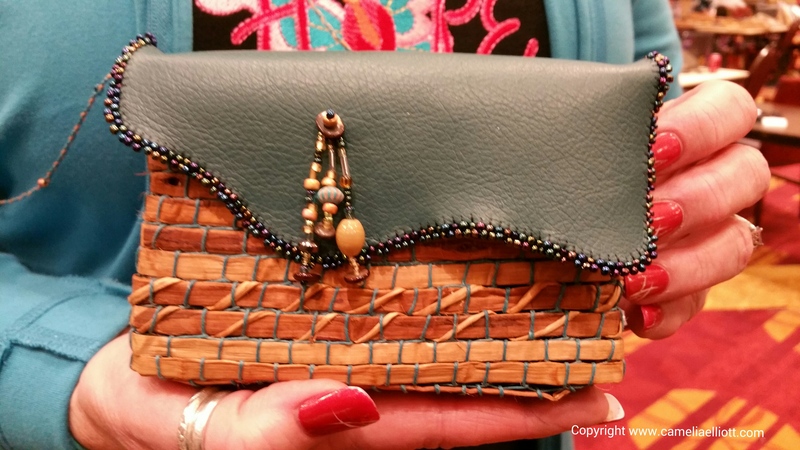 An exceptionally beautiful leather purse, beaded and stitched with Alaskan bark by one of Pam Talksky’s students. 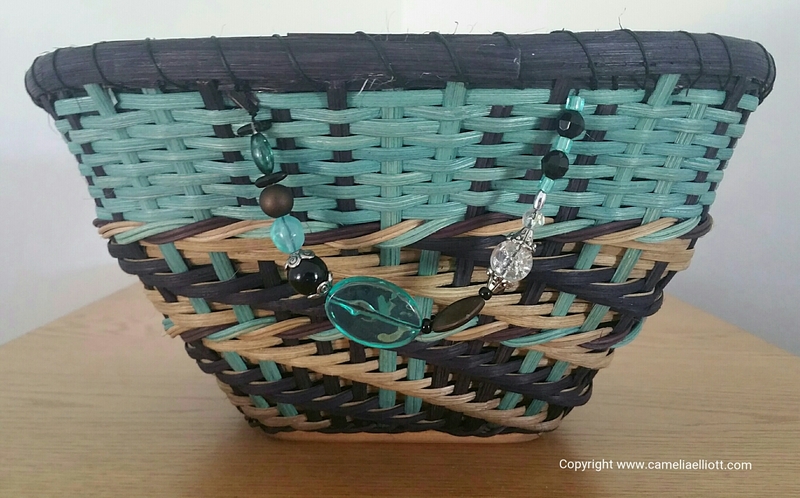 This basket is amazing and I would love to make one somday! 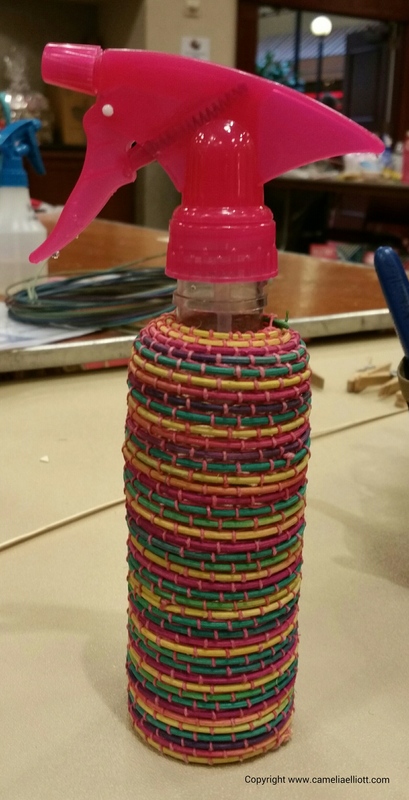 Cute little woven spray water bottle. 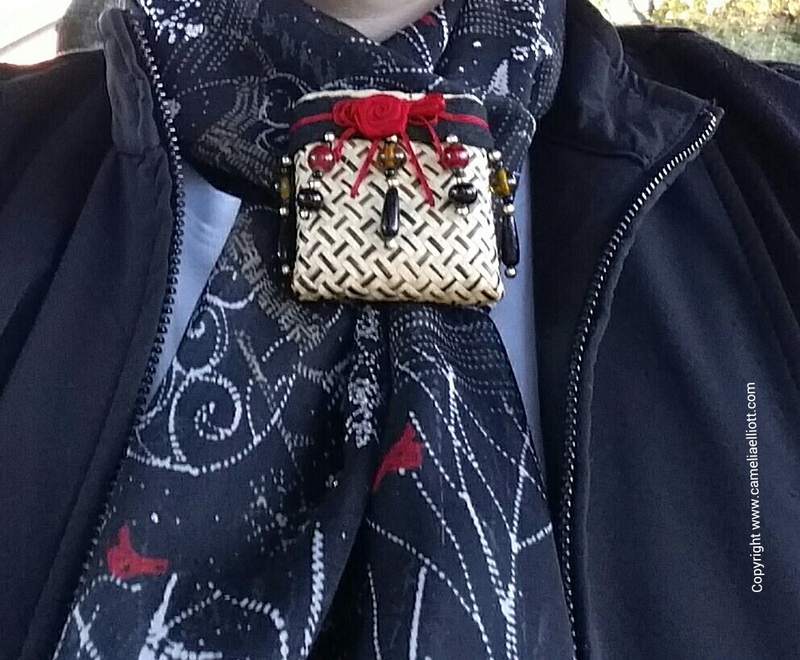 Darling little itsy bitsy basket. 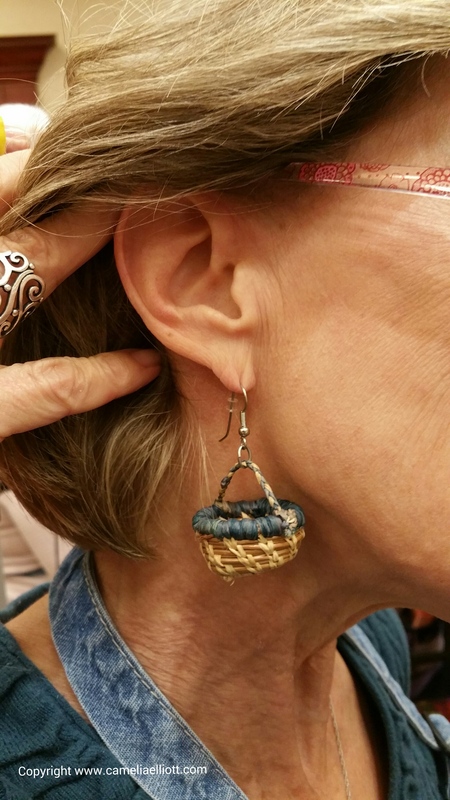 An extremely small earring like this one would take lots of patience! Beautiful details on a basket in progress. In progress of creating an amazing rim. 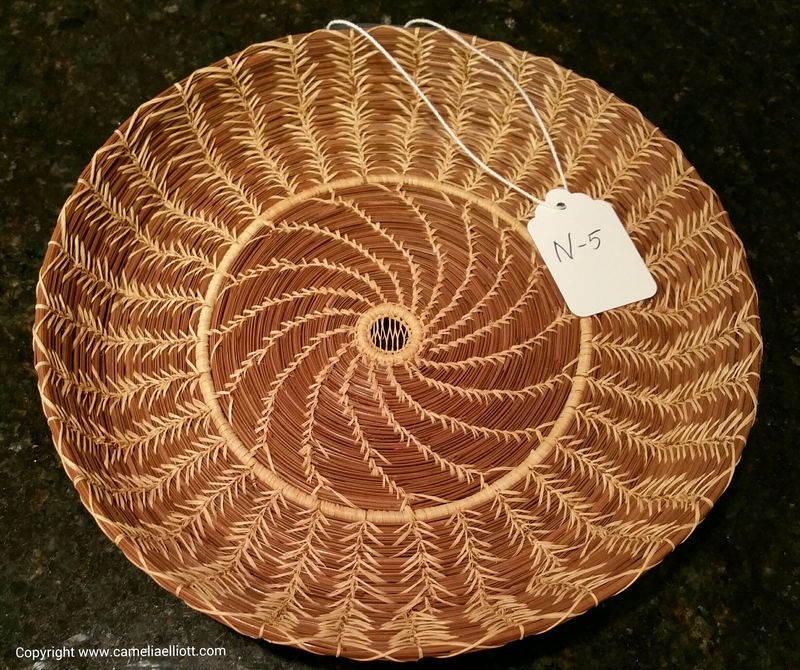 This finished corner basket is so pretty. 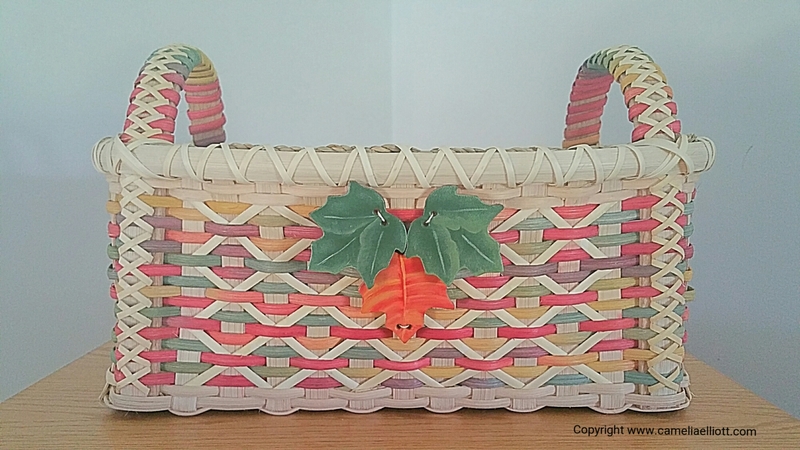 Combination of basketweaving and quilting creates a striking basket. This was in the Bittersweet Baskets and Supply vendor booth. 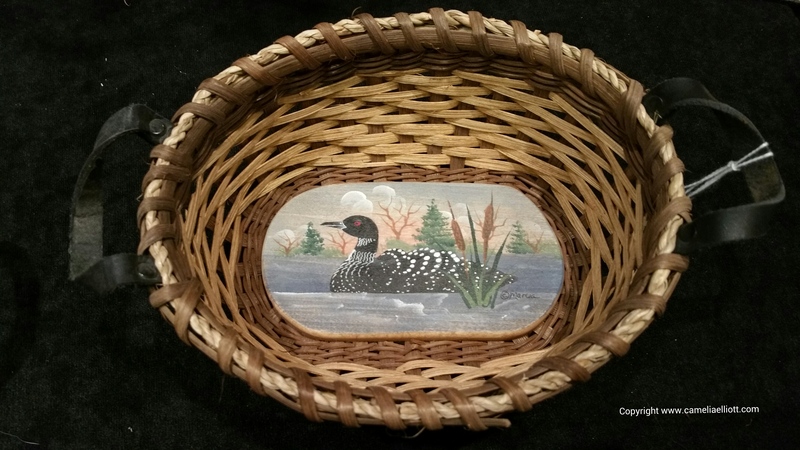 A basket with a painted base is so amazing. This was also in the Bittersweet Baskets and Supply vendor booth. Awesome miniatures in the Nate’s Nantuckets, Inc. vendor booth. 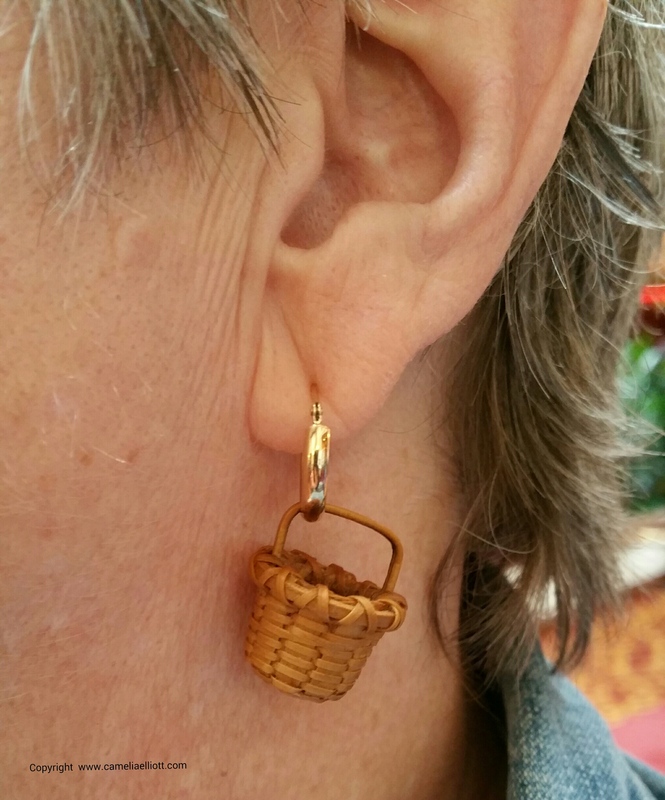 A woven basket that I wore to the gathering. This is actually a double wall. 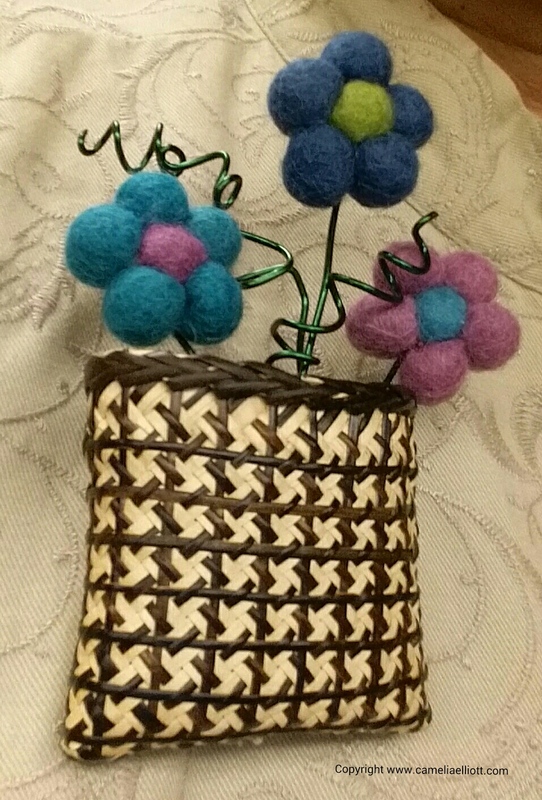 Another woven basket that I wore to gathering. This concludes my basket weaving series. I hope you have enjoying the posts as much as I have enjoyed creating them. My next blog posts will consist of a pecan farm and touring the Texas Hill Country Bluebonnet Trail. You will not want to miss the spectacular upcoming photos! 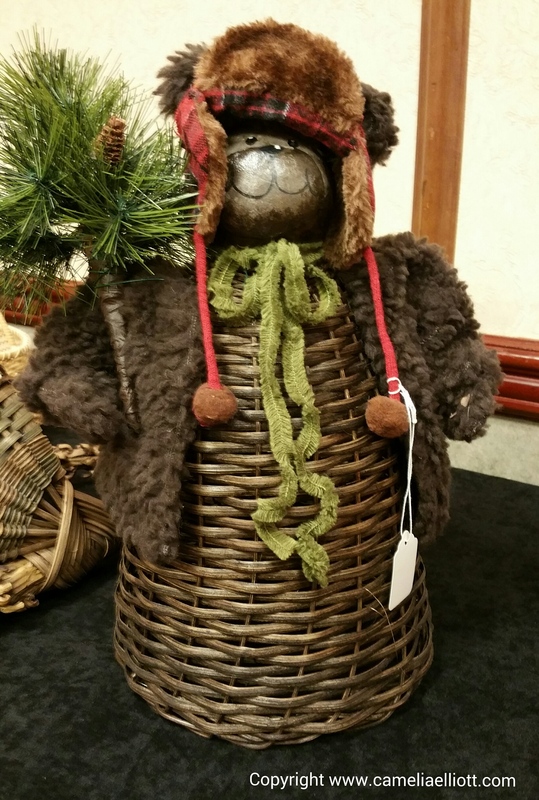 You will love seeing the work of talented basket weavers whose work was featured in “Stars of Weaving” exhibit at Texas Basket Weaver’s Association gathering 2015. 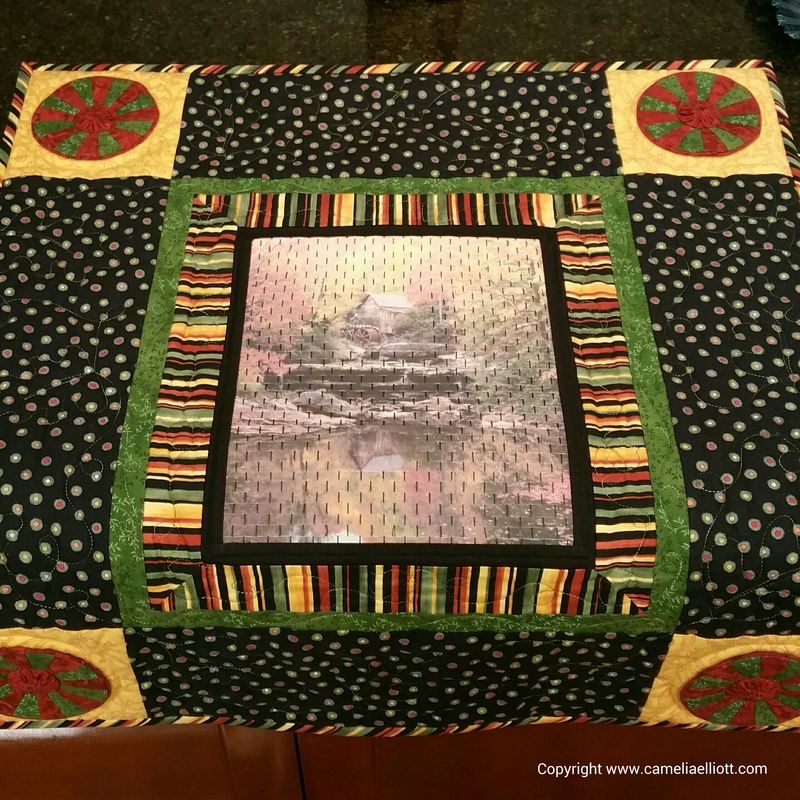 I entered this quilt. 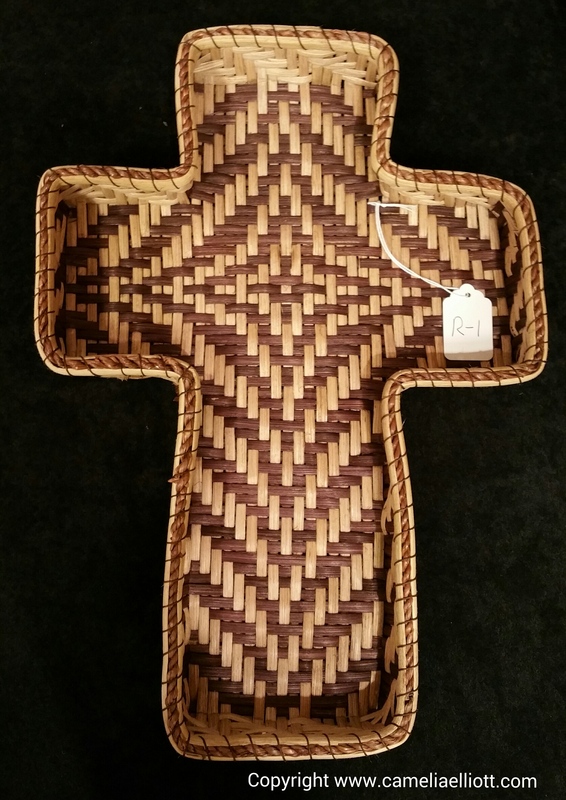 The photo in the center is woven like a basket, but on fabric. 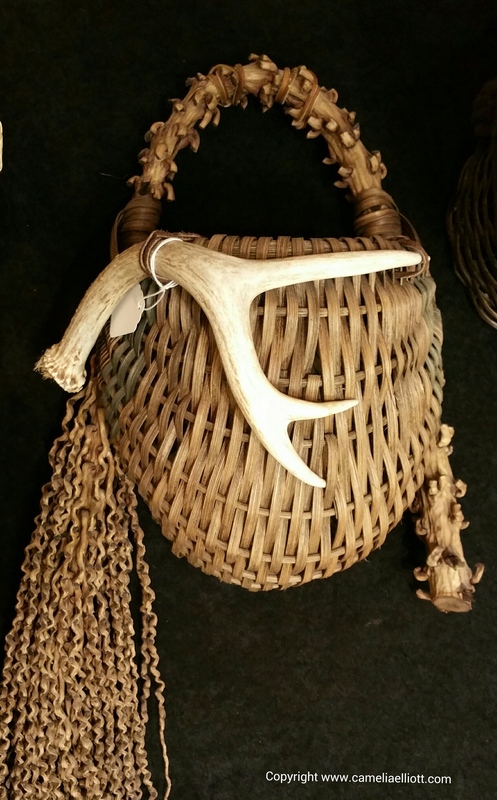 I entered this basket with strips of birch bark, ash, beads and waxed linen. 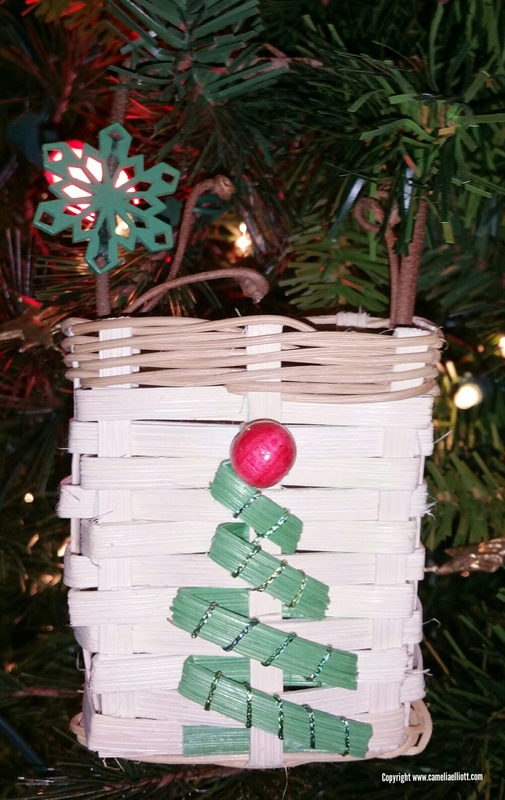 This beautiful pine needle basket is the winning entry. 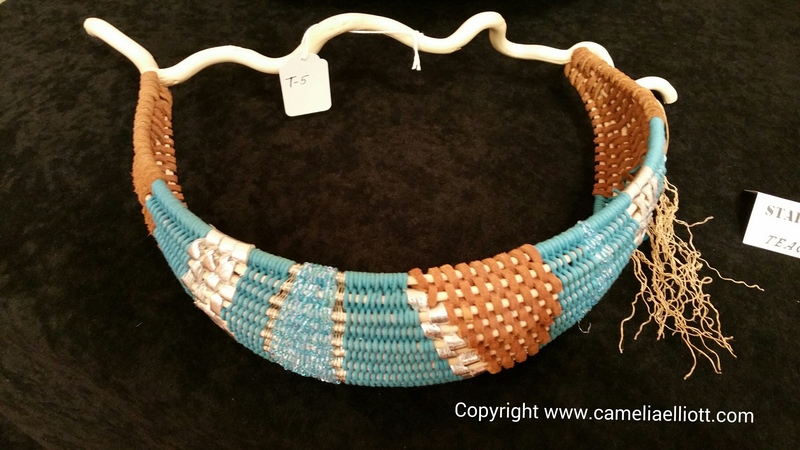 Candice DuCoin of Round Rock, TX is the winner of the NBO AWARD at the “Stars of Weaving” exhibit held at the Texas Basket Weaver’s Association 2015 Convention. “As a fifth generation Texan, I grew up loving the piney woods. This blog post makes me chuckle. 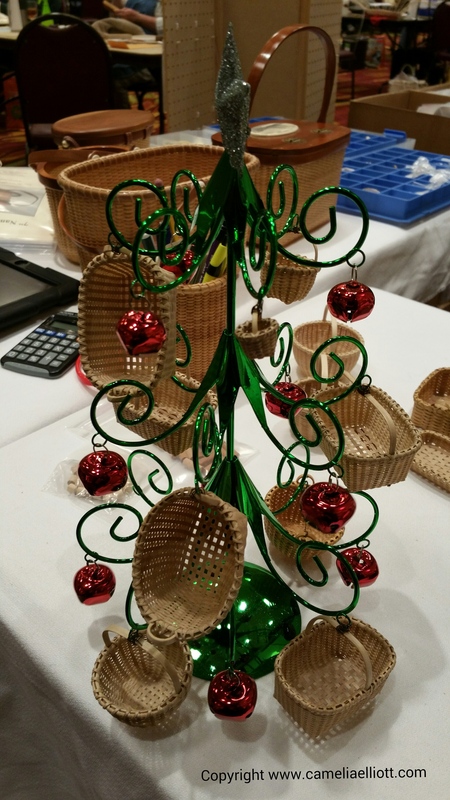 Did you notice how many photos I took on day one of basket weaving convention? I posted six photos on day one, five photos on day two and three photos on day three. 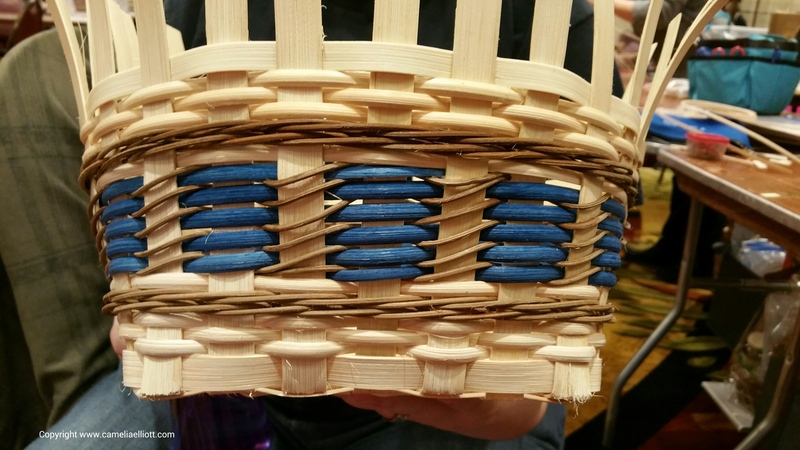 On day four, I didn’t even take one picture of my basket weaving progress! 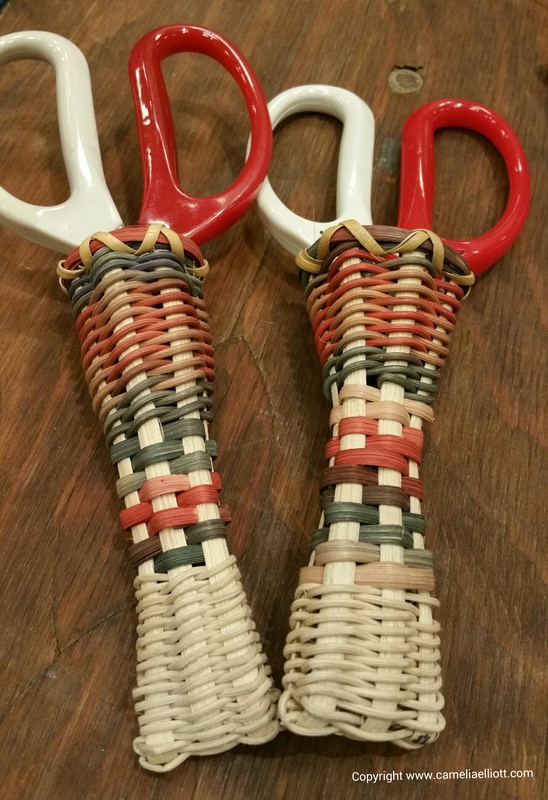 Basket weaving convention is an awesome event but it is labor intensive too! I’m up with the chickens, weaving all day long and don’t make it to bed until late. Saturday is extremely intense but a fun day. After basket weaving all day long and after dinner, there is market place where we can buy supplies from the teachers and vendors. After that, the silent auction and raffle items are distributed. I did not make it home until late. By Sunday morning, I was really dragging. 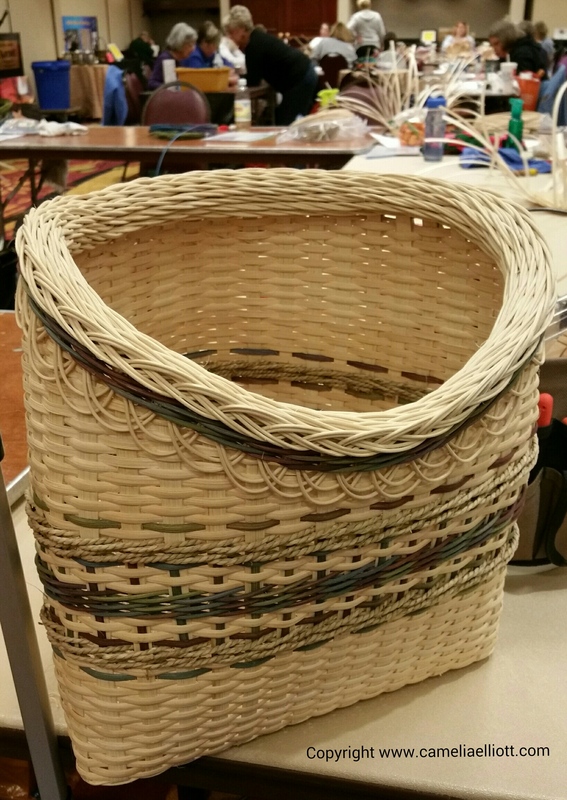 The below photo of my unfinished basket was taken after convention. 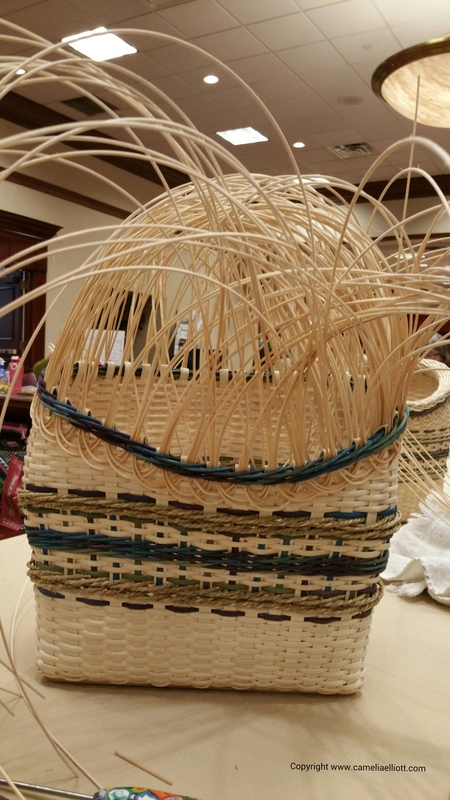 I was totally exhausted after four days of glorious basket weaving!